Personal Inventory: Face Three Problems. We need to face three problems if we are going to overcome our worries. They all are heart problems. In order to correct heart and spiritual problems, we need to make some important life changes. It is easier to avoid these needed changes. We have listed three ways people avoid facing the real issues: Unbelief, Excuses and Inattention. Often we do not catch ourselves deliberating over these important decisions. In order to overcome worries, we must pay close attention to these key decisions for this is where the battle is. We then realized that we had hit the real mountain. When I was a boy my Dad would take my brother and I hiking up into the New Hampshire White Mountains. The trail to reach the mountain was easy and delightful. But all of a sudden we would notice something had changed. We would notice sweat dripping from our face. Or perhaps, we would take a layer of clothing off. We then realized that we had hit the real mountain. Our bodies were exerting themselves as we ascended the mountain. In a similar way, through some of these decisions, you will feel the challenge to the way you regularly live your lives. This often happens by being tempted to think about other things or just dismiss these thoughts as being irrelevant. I encourage you to stick with us. We need to make personal decisions that will impact how we live our lives. Remember, we are crossing that bridge to God's peace. He is with us. He will strengthen us. I understand that some of you will be tempted to walk part way over that bridge and give up. 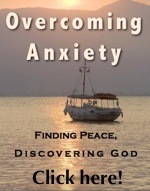 We need to remember that we cannot forever rightly deal with our anxieties on our own. God always wanted us to trust Him rather than ourselves. Now lets look a bit closer at the three reasons many are never able to overcome worries. Are we serious about what we believe? Do I take Jesus' words seriously? Unbelief is seen whenever we are not willing to go by the ________ __________ God has given us. Are we really desirous for God's peace? Do I defend my anxiety? Excuses are the way we avoid __________________ accountability for our own responsibilities. (3) Inattention Are we too busy? Do I depend on other things for security? Inattention is when we do not __________________ what is important and essential. Like a car designed to run with gas, so we were made to run by God's powerful presence. We have used ineffective synthetics which have disastrous side effects on our lives and in the end break down our whole system. Pause a moment. Tell God quietly that you need Him to go on. You can't make it yourself. Let's now look at the first excuse: unbelief.